From last year. Still relevant. First and foremost, I would like to thank the Parker County branch of the NAACP for inviting me to speak this morning. It might seem a bit unusual for someone of Hispanic and Native American heritage to be speaking at an event to celebrate and honor Dr. Martin Luther King Jr. but when one takes the time to ponder that issue, it becomes clear that we, as communities of color, have shared much throughout our parallel history as a people. Every year, since 2012, I have posted this piece I wrote. In light of today’s racial unrest, particularly from the campaign trail, we need to hear these words more today than ever. Four little girls. So few remember the event, fewer remember their names. Four little girls on 16th Street in Birmingham, Alabama. Four little girls, on a Sunday morning, walking into church. A box of dynamite, planted under the steps with a timer. Four little girls, their lives ended by hate. Addie Mae Collins, Denise McNair, Carole Robertson, Cynthia Wesley. Four little girls, a moment of time, frozen in our hearts and minds, so many years ago today…on that Sunday morning in church. I, for one, will say their names today. I will say their names with a resounding voice. Let our collective voices be louder than that hate-filled explosion. May the memory of the sacrifices Addie Mae, Denise, Carol and Cynthia made never be forgotten. Not martyrs by choice, just four little girls. Four little girls that changed the world. Lest we forget, Officers Smith, Ahrens, Thompson, Krol and Zamarrippa were killed two years ago today in Dallas protecting the First Amendment Right of protestors calling out police departments across this country to stop police violence. The oaths I took as a member of the Armed Forces required me to uphold and defend The Constitution. Not just parts of it. Not just the parts I liked. And not just parts I agreed with. Whether it’s an upside down American flag in Weatherford, Texas, taking a knee during the National anthem, climbing the Statue of Liberty or climbing a flagpole to take the “Stars and Bars” down. We have a right to free assembly and voicing our displeasure with our Government. Whether you’re Muslim, Jewish, Catholic, Buddhist, Sikh, Protestant, Jehovah’s Witness, Mormon, atheist, agnostic, Wiccan, Scientologist, Satanist or any other self-professed faith, you should not be encumbered from your own practice of those beliefs. The Press shall remain free to report (if not accurately, at least without government interference). Many thousands have died for these rights. Most were men and women of the Armed Forces. Many in law enforcement. Many others, in unmarked graves in Mississippi, Alabama and other places were civil rights were sought, trees and lampposts across the Nation, fence posts in Wyoming. Spanish and French soldiers who fought with the Colonists against the British. In jail cells in Waller County, Texas and other places. And four little girls in the basement of a church in Alabama. They seldom made a choice to give their lives. They were mostly unintentional martyrs. Nonetheless, their sacrifice was great. A sacrifice we should never forget. Hold our elected officials to the highest standard of their oaths. Remind them of these, and the scores of other, examples of what it looks like to “uphold and defend” the Constitution of The United States. For today we remember. Let it be so everyday. As many of you know, on Father’s Day, as well as Mother’s Day, I usually go through a long litany of the diverse people who make up fathers and mothers. Today, on the day before Father’s Day. I will break that tradition. I am drawn to the first book of Moses, Genesis 22, and the Binding of Yitzhak. His father Avrahim, is instructed to “take his son, his only son, whom he loves” and to offer him as a sacrifice. I have often read the story and I’m continually amazed at the faith this father exemplified. A faith not unlike a parent who would send an unaccompanied child to the US border, in good faith, that that child would be provided sanctuary and refuge from horrible conditions in that child’s home country. In the story, only after Avraham was willing to sacrifice Yitzhak, does God provide the ram. And, not surprisingly, this is the first use of the word love in the Christian Bible. The sacrifices of these parents, to either send an unaccompanied child, or or to make the treacherous trip with their children, along the Jericho Road that is the northern triangle of Central America and the Mexican desert, is indeed an exercise in faith not unlike that shown in the binding of Yitzhak. It is a faith grounded in a belief that they are doing the right thing. It is a faith that God will provide. It is a faith that is grounded in seeking sanctuary in a country that, for so long, believed in the mantra of sending the poor, the hungry and the huddled masses to our shores and borders. But in this time, and in this place, the United States has forgotten the fact that it claims to be a Christian country. So many in our government are citing New Testament writings of Paul to justify their treatment of the modern day Yitzhaks of the world. Where God intervened by sending a ram to sacrifice, it is my prayer that God will send a sacrificial ram by changing the hearts of Congress members in the form of compassion, acceptance, and legislation that recognizes our rich history of accepting immigrants, refugees, and asylum-seekers and continue to live out that history. Unbind these children now, whether they are newly arrived at the border or previously brought here by parents and are DACA recipients, or for some reason unable to apply for DACA. Unbind these children now. Congress, suspend your fear, your xenophobia, your pride, and your desire to do what is expected by this Administration rather than to do what is morally right. By doing this, your fear, xenophobia, pride, and desire to cling on to your committee chairs, become the sacrificial ram rather than these children. Over the years, I have heard many a sermon, given one or two, attended lots of Sunday School classes, taught nearly as many, been to religious conferences and seminars, taught a workshop or two a seminaries, worked ecumenically and Interreligiously at all levels. During all those times, I have brushed against a person or two that I wholeheartedly disagreed with, either philosophically or theologically. I have found, however, that the best was to proceed as if I might be wrong. It usually prevents me from saying something I might regret a and helps me to love my neighbor when there is a clash of ideas or ideals. Tonight I threw that rule right out the window! Always when it happens there is the troubling question that begins with the word, why, and the struggle for an explanation begins. Law enforcement officials begin an intensive investigation into the background of the person or persons responsible for the killings. One of the main questions is that of motive – exactly why did the shootings happen? What was in the mind of the person or persons who committed the violent acts? What is not recognized and there will be massive resistance in facing what has been happening now for decades is that seed has been sown and it is now harvest time! Or to use a quote that has been around for generations: “The chickens have come home to roost!” The “foundation” for it all was laid back in 1963 when the U.S. Supreme Court made about the deadliest and most costly decision it ever made in the history of the United States. The Court declared that the practice of having the Lord’s Prayer and the reading of the holy Scriptures each day in classrooms of public schools would no longer be permitted! All students had been exposed to the fact that there is a God Who is accessible through prayer and that He has given us a special revelation commonly referred to as the Bible. Even students whose parents were not church involved were exposed to this reality – there is a God and He has given us His holy Word! This experience took place 9 months out of each year, 5 days each week! In the decades and generations since that fateful decision of 1963 we have large numbers of heathen who are reproducing – absolutely no exposure to the truth that there is a God Who holds all of us accountable and One Who loved us so much He sacrificed His Son, Jesus, to make forgiveness possible for each human! But something else began to happen as well. The entertainment industry used to hold to standards of decency. Hollywood would not permit profane language to be spoken in films produced. Violence was extremely limited when shown in conflicts. Moral standards were quite high as depicted on the screen. But that began to change. Word by word profanity began to be used. Violence was increased and immorality began to be graphically displayed. The violence was even more graphic with slow motion splattering of blood, brains and guts! The immorality involved sexual scenes and the actors and actresses appeared naked! Music also has changed greatly with lyrics often depicting some type of violence or acts of immorality! The time for video games arrived followed by hand held devices with games and access to all manner of highly questionable material. Violence and immorality are a common part of the entertainment “diet” offered through movie and TV screens and a myriad of hand held electronic devices in today’s world! Our culture became an increasingly violent one as the Supreme Court issued another decision 10 years after the ban on prayer and Bible reading in the public schools. That decision declared that a pregnant female has the constitutional right to have her unborn child murdered if she so chooses. The murdering of an unborn child is a violent act! You say, no? What do you call it when one person uses tools to dismember and intentionally kill another person? This happens thousands of times a week in our republic. Over 60 million acts of intentional homicide involving unborn children have taken place so far since 1973! The young in our republic have for decades been continually exposed to violence that has its fountain source in the world of entertainment! It is a kind of brainwashing experience for them. The influence of this moral and ethical junk conditions them to accept violence as a way of settling differences in their life experiences. If someone or more than one someone does you wrong, then you settle it by resorting to violence. A gun is simply one of a number of ways this can be done. The use of the gun, however, gets the most publicity! Is there a solution to this problem which is comparable to a cancer out of control? It would mean a very drastic change in the arena of entertainment – a radical “cleaning up” process which the people who are in control would be unwilling to do mainly because big money is involved! Even if there would be the drastic changes implemented it would take a generation or two before significant improvement in our quality of life would take place. Things continuing as they have been and that is how it will be – in fact, it will likely be getting worse. The violence will erupt time after time following identical patterns. Signs at present time indicate we as a nation are on the path leading to absolute and certain judgment at the hands of a holy God! As far as police killings, those numbers entered triple-digits in 1909, with the highest number killed in a single year, 307, was in 1930. That is nearly double the number of most subsequent years, including 2016 and 2017. The spike years were wartime years between 1914-1918 and from the 1920’s through the 1940’s. Although tying mass shootings and police killings to those specific SCOTUS rulings may be totally inaccurate and perhaps even irresponsible, I think the texts in 2 Kings, Habakkuk, Jeremiah and even Matthew suggest a wicked nation could punish Israel. Maybe the question we should be asking ourselves is whether America is the New Israel? Understanding Scripture is difficult. Understanding the criminal mind is an even greater challenge. I like to think I know a little bit about each. What I read tonight was uniquely insenitive and irresponsible. But I couldn’t proceed as if I might be wrong. Because, in this case, I don’t believe I am. Blocked from posting on a “progressive” Methodist page. He responded with a critique that I was trying to guilt the poster by introducing a non-sequitur of white privilege where it did not belong. My response was basically that his comment pretty much proved my point. I was then blocked by this poster from further reading or contributing to this thread. I went back to the page, with the help of my wife’s account, to see what other responses were there. One chastised him stating his action in blocking me was “un-Godly.” No one addressed my comments. Nor has anyone reached out to me as they apparently don’t see my perspective as valid or worth addressing. Those of you who know me know the work I do for the denomination, know the work I do ecumenically, and know the work I do professionally. If there is anyone qualified to make the statement I did in this thread, it is me. I have been an ally of the Reconciling movement for well more than a decade AND I have worked side-by-side with those in the Confessing movement. I may be criticized for being critical of both sides of the “big issue” before GC2019 and GC2020, but that’s okay. The bigger issue is that we have further marginalized persons of color, the disability community, those living with HIV/AIDS, women and the poor in an effort to stand with one side or the other in this doctrinal debate. The debate is an important one, but not at the expense of all these other groups and certainly not at the expense of losing sight of what it means to be the Body of Christ. Read my words from The New Methodist thread. I believe they are words that we, as a denomination need to hear. There is more at stake in 2019 and 2020 than just this one issue. Perhaps we have been listening to the wrong voices for too long. Dr. King and Cesar Chavez held a mutual respect for one another, as they were true contemporaries in a time of social change. Earlier that year, Chavez led a march from Delano, California to Sacramento. The march was approximately 300 miles and was held to have demands of Mexican, Puerto Rican and Filipino farmworkers heard and to bring light to the manner in which farmworkers were mistreated. “My friends, if we are going to end the suffering, we must use the same people power that vanquished injustice in Montgomery, Selma and Birmingham. “I have seen many boycotts succeed. Dr. King showed us the way with the bus boycott, and with our first boycott we were able to get DDT, Aldrin, and Dieldrin banned in our first contracts with grape growers. Now, even more urgently, we are trying to get deadly pesticides banned. “The growers and their allies have tried to stop us for years with intimidation, with character assassination, with public relations campaigns, with outright lies, and with murder. “But those same tactics did not stop Dr. King, and they will not stop us. “Once social change begins, it cannot be reversed. The United Farm Worker movement and the Civil Rights movement were intractably interwoven into a tapestry of shared histories and marginalization by those who saw people of color as something less than human. Dr. King states in the speech we just heard that “five score years ago, a great American, in whose symbolic shadow we stand today, signed the emancipation proclamation.” Attempts to organize farmworkers in California and the Southwest had been going on for that same 100 years. It was only when the Farm Workers movement adopted the Gandhi-born practices that Dr. King used in the Civil Rights movement that the United Farm Workers gained traction. But our histories, as people of color seeking equality and equity in the United States goes far deeper. It is born of a mutual history of kidnapping, enslavement, and murder. It is a mutual history of seeking to be recognized as people and not property. It is a mutual history of seeking what is right and what is just, denied to us because of our ethnicity, our language, our national origin, and more often than not, simply the color of our skin. And yet, we now face, and will face in the future, a history that seems to go backward to a day when white supremacy was the rule and people of color were viewed with animosity and hatred. The Equal Justice Initiative, in Montgomery Alabama, reports that there were 3,959 lynchings in 12 southern states between 1877 and 1950. From 1848 until 1928, thousands of Mexicans were murdered by mobs. Many of these at the hands of Texas Rangers and deputized officers. Occurring throughout the Southwest, but also in places like Nebraska and Wyoming, there were at least 547 documented lynchings of Mexicans during that time period. We cannot forget the internment camps to which entire Japanese-American communities were forced into during World War II or the repatriation of Mexican Americans during the depression in the name of job scarcity. More than 2 million men, women, and children were deported to Mexico. Over 60% (1.2 million) of those were American citizens. And, we cannot leave out the genocide committed against our First Nations people. But now, I think, for people of color, there is a new type of lynching occurring. It is found in the horrific legislation and judicial rulings that we have suffered and have borne upon our backs since April 4, 1968, and more so, recently, that makes me wonder if we will ever see Dr. King’s dream realized. But, 55 years after Dr. King wrote those words, the heartless are no longer restrained by judicial decrees, nor does their behavior seem to be regulated. Yes, it is true that morality cannot be legislated, but it seems as if the heartless have been given free rein through the acts of presidential tweets, comments, executive orders and Congressional non-action. We have seen the Supreme Court gut the Voting Rights Act. We have seen Cliven Bundy, who led an armed standoff against federal agents, have charges dismissed just last week. And yet who can forget the images of peaceful protesters being gassed by militarized police officers in Ferguson? How can we dismiss from our minds the images of Baltimore, of Milwaukee, of Tamir Rice in Cleveland, of San Jose, Albuquerque, Los Angeles, and across this nation? How can we forget the failure to charge the vast majority of police officers who, according to the Washington Post, shot 987 civilians in 2017, of which 236 of those killed suffered mental illness, 68 or more were unarmed, nearly 600 were not fleeing, and at least half were people of color. And yet, many in this country look to the false narrative of “Make America Great Again.” How is it proposed to do this? We limit, or eliminate entirely, immigration. We decry immigration from certain countries in the most desultory, profane and obscene manner. We refer to those fleeing violent-ridden and war-entrenched countries as murderers and rapists and terrorists by lumping large groups of people together despite their cultural and national differences. We embrace American Christianity at the expense of those middle eastern Christians who faced death for practicing their faith. We demoralize and demonize religions and faith of others while living in the idolatries of white privilege and status quo. And we stand by and watch as Congress works to approve an immoral budget that is fraught with racism, xenophobia and jingoism. For instance, the house has approved the budget that may increase the deficit by $1.5 trillion. $1 trillion will be cut from Medicaid and $470 million will be cut from Medicare. And yet Congress has approved $1.6 billion for the start of a wall along the US Mexico border. It has been suggested that this wall will eventually cost $18 billion or more. And now, a tax reform that greases the palms of the very wealthy and corporations and yet hurts those families who live modestly within their means. How does it Make America Great Again when its leadership slashes $150 million from HIV-AIDS programs at the US Center for disease control and prevention, $26 million from a program designed to house those living with AIDS, and just over $1 billion for programs which seek to treat and prevent HIV and AIDS abroad? And yet, just a few miles to the east of us, in Tarrant County, the leading cause of death for black women between the ages of 25 and 34 is AIDS. For black women between the ages of 35 and 44, it is the second leading cause of death. How does it Make America Great Again when approximately 40% of those receiving treatment for HIV and AIDS in America received that treatment through Medicaid. The current administration is doing its best to eliminate access to medical care through the elimination of the Affordable Care Act and through massive cuts in Medicaid and Medicare. And to add insult to injury, two weeks ago the President fired those members remaining on the President’s Advisory Council on HIV/AIDS (other members had previously resigned in protest to Trump’s budget cuts) and has yet to appoint a director to the White House office on national AIDS policy. Why is this important? Because 45% of people living with AIDS in America are black, despite making up only 12% of the population. About one-quarter of all new HIV diagnoses are among Hispanics/Latinos who make an 18% American population. Approximately one-third of the population of the United States suffers from diabetes. The burden of diabetes is much greater for minority populations than the white population. For example, 10.8 percent of non-Hispanic blacks, 10.6 percent of Mexican Americans, and 9.0 percent of American Indians have diabetes, compared with 6.2 percent of whites. Certain minorities also have much higher rates of diabetes-related complications and death, in some instances by as much as 50 percent more than the total population. Specifically, the American Diabetes Association reports that African Americans, Hispanics, and Native Americans experience a 50–100% higher burden of illness and mortality from diabetes than white Americans. The risk of diabetes is 77% higher among African Americans than among non-Hispanic white Americans. African Americans are almost 50% more likely to develop diabetic retinopathy than non-Hispanic whites. 11.8% of Hispanic/Latino Americans ≥ 20 years of age have been diagnosed with diabetes. The risk of diabetes is 66% higher among Hispanic/Latino Americans than among non-Hispanic white Americans. Hispanics are 1.5 times more likely than non-Hispanic whites to die from diabetes. Diabetes was the fifth-leading cause of death for Asian Americans and Pacific Islanders, rising from being the eighth-leading cause of death in 1980. Native Hawaiians have death rates from diabetes that are 22% higher than that of the entire U.S. population. Asian-American women are 177% more likely to test positive for gestational diabetes mellitus than white women and tend to develop it at a lower body weight. At nearly 16.1%, American Indians and Alaska Natives have the highest age-adjusted prevalence of diabetes among U.S. racial and ethnic groups. In the last decade, the rate of death due to diabetes for American Indians and Alaska Natives was three times higher than that of the general U.S. population. And yet, The Eliminating Disparities in the Diabetes Prevention, Access, and Care Act was sent to the House Subcommittee on Health on June 5, 2015 where it apparently has taken up permanent residence. When it comes to suffering high blood pressure and hypertension Hispanics are at an elevated rate than non-Hispanic whites. 36% of blacks suffer high blood pressure and/or hypertension. This, is the new lynching. It is done through the courts. It is done through legislation at the federal and state level. It is done through executive order. And it is done not in the dark of night, on horseback, with Night Riders wearing white hoods. It is done through the hateful invective we hear from the highest offices, from news sources that were once objective but now only exist for entertainment. It comes equally from the alt-right and from the extreme left. And it comes from the Democrats and the Republicans by overt action and overt inaction. It is spread virally across our Facebook pages. And it is spewed on Twitter feeds. And the consequences, for people of color, are truly life and death issues. They are affecting our ability to vote, our ability to earn a living wage, our ability to obtain an education at all levels, our ability to seek fair recourse and due process in the courts, and it is dramatically affecting our access to health care by eliminating programs and funding that will curtail treatments for diseases that are chronic and fatal at a disproportionate level to people of color. If that’s not extrajudicial lynching I don’t know what is! And so you see, I returned to where I started this morning, and hope that I answered the question as to why a person of Hispanic and Native American heritage is speaking to this group. It is because all people of color need the good work of the NAACP. All people of color need to break down the barriers that have explicitly or implicitly been built to keep us from unity and the strength that comes from being one. We must hold one another accountable for, not only registering to vote (a hard-earned right), but also to get out and vote. We must lift our unified voices and demand equal representation by our elected officials, as well as hold our candidates and potential candidates to a high expectation. We can no longer allow our communities to be referred to as a block of voters…we are individuals and communities with unique needs that no political party, political action committee, elected official or candidate can meet if we don’t voice those demands and hold those in power accountable. We can no longer afford to sit in silence. We must overcome our silence and our fears to become the multiracial army Dr. King envisioned and “storm the battlements of injustice” as if our very lives depended on it, because, my brothers and sisters, they do. You see, if we are to make it through these trying times, we must make it together. For, unlike John F. Kennedy’s statement that “a rising tide lifts all ships,” we can no longer afford to be in separate boats charting our own separate courses with no rudder and no means to guide us. We must realize that we are in the same boat that must be rowed together – sharing the same moral compass. And in that, may we realize this dream. It seems to me that my prayer life has never been one that I would have hoped for. It’s not that I don’t recognize the importance prayer in my life, I simply don’t find or make, nor do I prioritize, time for daily prayer. It’s not that I don’t pray, I just don’t feel that I do it nearly enough. In 2017, I made it a point that, when I saw a Twitter or Facebook post asking for prayer, I would stop whatever I was doing at that moment and say a prayer on behalf of the person asking. Prior to that, I would often simply type the words “praying” or “praying for you” and then go about my business without fulfilling that promise. After making this adjustment to my prayer life, I found myself praying many times during the day. It also became evident to me, that I was spending an awful amount of time on social media! I have “friends” that I have never personally met. I chat with them on Messenger, we share political and theological ideas and debates on Facebook. We trade recipes and DIY ideas on Pinterest, and, although I don’t do it (often), we send random photographs of ourselves (or what we happen to be eating in a restaurant) through various means of social media. We have relationships with people we have never personally met and likely, will never personally meet. We have become, as Thomas writes, “virtual people.” In the process, we have lost some of our filters, civility and humanity. Thomas also opines that; all this use of technology has created a society in which “Internet isolation” has become the norm and not the exception. It is through these easily found friends and Internet relationships that we have become more and more distracted from our relationship with God. It has become quite evident to me that I am becoming more and more isolated as I have created a bigger and more diverse digital footprint in that ethereal world that is the Internet. Considering that I read “Digital Disciple” on my iPad and will be posting this writing on my blog, I’m not quite ready to give up my digital existence cold turkey. In Step Two, the author gives thanks for all the ways in which he was blessed that day. This is a direct result of having opened himself up to God’s presence. By writing these reflections in a journal, they become more than an ephemeral petition to God, but become eternal within our own personal history and relationship with Christ. Speaking for myself, I have enough trouble remembering what I had for lunch yesterday, much less, what God did for me and those around me today. This step will help me internalize God’s impact in and on my life. The third step revolves around those things that occurred during the day that ether brought one closer to God or pushed a person farther away. These things can be either “mundane” or “extraordinary” events. I usually find myself too wrapped up in the immediacy of the things that are before me that I take no time to reflect on the presence of God in all that I do, all that I say, and among all those whom I meet. This is where, because of all the things I must do or choose to do during the day, I become isolated from God. Thomas points out that the distractions are not necessarily caused by our “Internet isolation” but maybe that the nature of our relationships with others have changed so much through our digital presence that we may not be as socialized as our parents and grandparents were. I think back just a year or two ago when I believed that texting was the most horrible way of communication imaginable. If one had to take the time to type in a message, why not just call me? Now with Siri, Cortana, and all the other voice-to-text capabilities of the modern smartphone, my number of actual phone conversations has dropped dramatically. It’s awfully difficult, if not impossible to make a disciple of Jesus Christ for the transformation of the world via SMS (standard rates may apply). Step Four is a reflection on “a particular encounter or conversation with an individual during which [one] did or did not fulfill [his or her] promise as a disciple of Jesus Christ. This step becomes a distillation of the prior three steps. I think this is the step that will cause me the most frustration. I like to think of myself as a “Red-Letter” Christian but, I am sure, without a doubt, that others would never see me in that light. But what I do know is that I strive to follow the pathway that Jesus has set before me. Christ’s instructions are clear: Love God. Love my neighbor. Serve the poor. Serve the marginalized. In the simple mandates that Jesus has given us in those “red-letter” verses of Scripture, my own distractions become my greatest obstacle to that person Christ would have me be. In this step, I could read of putting my shortcomings in this area by committing them to writing. The fifth and final step is, in my mind, the most critical. Thomas suggests reading what I have written and then write a sentence about what I will do tomorrow considering what happened today. The first four steps require centering and objectivity in reviewing one’s actions and inactions during that day. But as Thomas correctly states, “this work is incomplete without seeing past the reflection to the future beyond. And so, the final step collects the day’s blessings and reflections and distills them to a few words of discernment about tomorrow’s walk with Christ.” As I filter the reflections, blessings, and discernment I have written, I will find myself detached from all the things that impeded my spiritual walk through and focus on where God was working in my life and where I was keeping God away at arms-length. And through this process, a prayer is formed. As I find myself bombarded by work, family, social media, news, television, events all around me (both locally and globally), and yes, even church, Thomas’s methodology appeals to me as I find a greater need to be centered in my relationship with God. And to that end, to my family, to my friends, to my neighbors, and to myself, I will strive to become less isolated by all the things that really aren’t as important as I have unintentionally inextricably prioritized in my life. I will go to the park with my children. I will take my wife on a date. I will visit my family more often. I will meet an old friend or make a new friend and share a cup of coffee or tea. I will hand write a letter regularly to someone I care about. I will turn off the phone, shut down the computer, and turn off the television. I will read a book. I will strike up a conversation with a stranger. Adventus. Advent. That period of time we have come to know as the lead up to Christmas and the coming of Christ. But over the years, it has become much more than the start of the Christian calendar and the four Sundays before Christmas. Starting as early as August, we start to see the advertisements, we see the store decorations, we begin to see the sales in stores. Adventus. It long meant the coming of someone notable. Now, it is more likely to mean the coming of Black Friday. The season is filled with requests for money to gain that last-minute tax deduction. 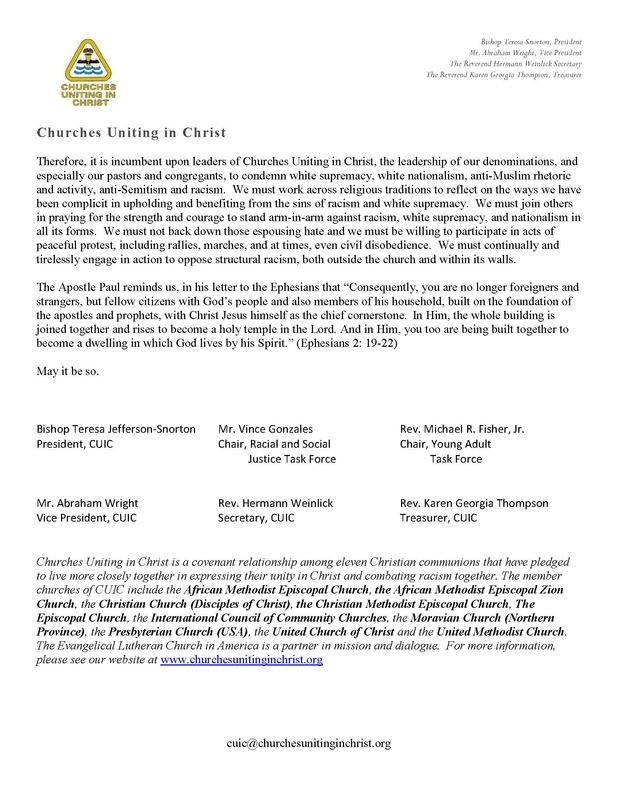 Groups supporting schism in the denomination asking for money. Groups advocating for photo ops rather than true ministry wanting donations. Organizations and agencies that have become rudderless ships with no moral compass, pleading for funds. For many years now, my struggle with Advent has been an internal battle. I have sought to find my own place within the Body of Christ amidst the sacrilege of the commercialized season. It has seemed to be a spiritual war that has lasted all too long. And one I wasn’t sure that I would see spiritual victory in my life. This year, it dawned on me, with, sudden insight, that it is not about the coming of Christ in my life. No, it is something far more important. Our family spent a couple of days at my wife’s family Christmas (a few days early) in Clarendon, Texas. On the way there, we drove by First United Methodist Church in Childress to “check it out,” as an appointment we might someday see. The trip to Clarendon was not notable, it was simply a road trip. A good time was had by all. Good food, Good company. Fun for the kids and fellowship for the adults. Fun gifts and tales of the past year. But something was amiss. Some void in my heart and soul. On the way back to Weatherford, also along Highway 287, while Shelly and the boys drifted off to sleep, the road trip became a tour of history for me. For those of you who know me, you know my vocation. For those of you who don’t, I have been doing anti-death penalty work for 30 years. I have worked on many defense teams trying to prevent my clients from receiving a death sentence or trying to get those individuals off death row through the appellate system. I remembered visiting the father of one of my clients in Clarendon many years ago. The father was a fireman at Pantex. My client was a member of the Aryan Circle, charged with Capital Murder for the killing of another white supremacist. We saved his life. The next memory was driving through Memphis, Texas. We represented a young man who burned the high school down. We kept him from spending all of his remaining life in prison. Along came Wichita Falls. We represented a man, horribly abused as a child, convicted of killing a drug dealer. We were able to spare his life. Next stop along the way home was Montague County. We went to trial with a nurse charged with killing 10 patients under her care. After a pair of mistrials, we were able to plead her, thus saving her life. Finally, also in Montague County, I was on a defense team that represented a young man charged with killing the grandparents of his girlfriend. The two murder victims, coincidently were named Mr. and Mrs. Christmas. After a hung jury, a plea bargain resulted in saving the client’s life. As I recounted the events surrounding these spots on the road home, my mind turned to my current clients facing the death penalty, one of whom is in the Tarrant County Detention Center. So, after this morning’s worship, my service began. I packed up my briefcase and headed to the jail. Adventus. Advent. The coming of Christ in someone else’s life, facilitated because I entered into a relationship with one who many would have turned their back against. Saved from the Christianity of bad theology, saved from the Christianity of bigotry and judgment, saved from the probability of missing the coming of Christ to one desperate for the Word. And saved from the false meaning of Christmas and corrected so well centuries ago by the Vatican. Christi dein adventus salutis eventus fuit quo sua ex infirmitate erepta est ratio atque impedimentis liberata quibus ipsa sese omnino incluserat. The coming of Christ was the saving event which redeemed reason from its weakness, setting it free from the shackles in which it had imprisoned itself. May Advent be the unshackling of our reason, our tradition, and our experience so that we may read the Word, hear the Word, know the Word, but most importantly, respond to the Word in making Disciples of Jesus Christ for the Transformation of the World. Disciples…wherever they be found. Adventus. Advent. May the hope of the coming of Christ last more than four weeks. May it always be in our hearts. 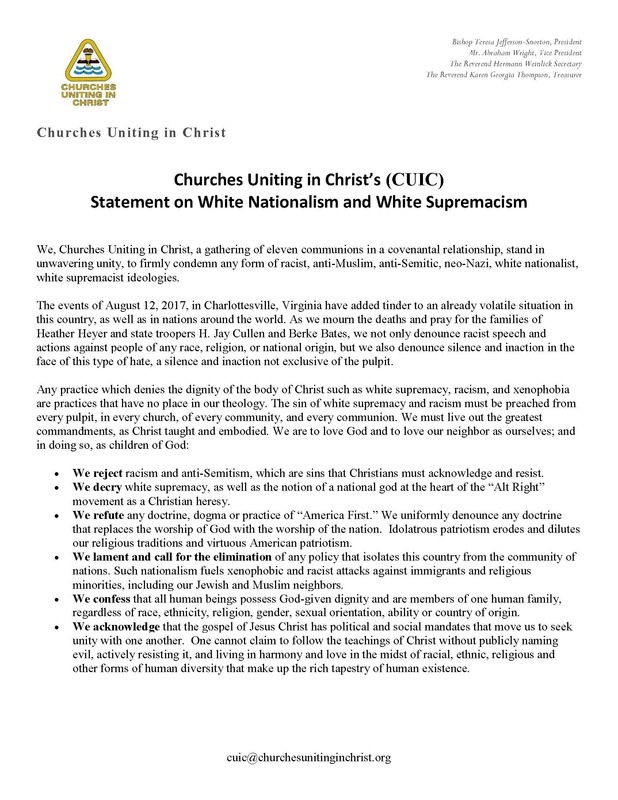 Churches Uniting In Christ released this very important statement today. Evangelical Lutheran Church of America (dialogue partner). This group was created in 1962 and was originally called Consultation On Church Unity. I am the Chair of CUIC’s Racial and Social Justice Task Force. Please distribute among your circles.